For people with the surname Ticehurst,, see Ticehurst (surname). Ticehurst is both a village and a large civil parish in the Rother district of East Sussex, England. The parish lies in the upper reaches of both the Bewl stream before it enters Bewl Water and in the upper reaches of the River Rother flowing to the south-east. 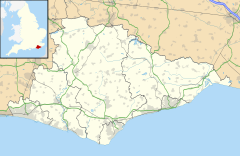 The parish includes the parish wards of Ticehurst, Flimwell and Stonegate. The linear settlements of Berner's Hill and Union Street lie between Ticehurst and Flimwell. It lies to the south-east of Tunbridge Wells, and is about ten miles (16 km) distant. Ticehurst is not mentioned in the Domesday Book; the manor came into being in the 14th century. Pashley Manor is also mentioned at the same time, and is within the parish. Ticehurst is part of the electoral ward called Ticehurst and Etchingham. The population of this ward at the 2011 census was 4,679. There is an active village club,which runs regular social events, and a monthly newsletter "News & Views" is produced by a team of volunteers. The village school serves both Ticehurst and Flimwell. There is also a comprehensive website  covering most of the activities in the community. Ticehurst House Hospital (now part of the Priory Group) specialises in the treatment of psychiatric disorders and is located in the village. Samuel Newington opened the original Ticehurst House in 1792 as a place dedicated to the care and treatment of psychiatric illness. In the centre of Ticehurst there is a dry cleaner, hairdresser, greengrocer, chemist, Indian takeaway, car salesroom, car repairer and MOT centre, general village shop (incorporating a post office), model shop, estate agency, a bank (National Westminster), two antique furniture dealers and two pubs, the Chequers Inn & the Bell Inn Hotel (which reopened in 2012 following a complete refurbishment), the Greedy Goat Cafe, a fishmonger and locally reared meat supplier at The Fish Shed, and a café within Newington Court. A secondhand children's clothing shop called Merry Go Round opened in 2015. Artichoke Gallery opened in 2014. From 1974 to July 2018 the village was home to the headquarters of the Antiquarian Horological Society, at New House, on the square. The village is also home to the first pick-your-own fruit farm to open in Britain, Maynard's Fruit Farm, made The Times "Top 50 places to eat outside in Britain" list. Outside the village there are dairies at Northiam and Stonegate, a bakery at Bodiam, family butcher in Etchingham, a smokery and two more pubs at Three Leg Cross and Dale Hill. One claim to fame is that the Scottish singer/guitarist Bert Jansch lived in Ticehurst in the late 1960s and recorded tracks for his 1971 Rosemary Lane album at his house in the village. Ticehurst was also the final residence of Evelyn Waugh's first wife, Evelyn Nightingale. The village church, St Mary's, was the venue for the wedding of her son, the journalist and theatre critic Benedict Nightingale, to the author Anne Redmon. Pashley Manor Gardens is promoted by the Historic Houses Association and by the Campaign to Protect Rural England. The gardens hold an annual tulip festival each spring. The event in 2016, between 22 April and 7 May, has 30,000 tulips, with over 100 varieties. The village is linear in shape and is the largest of a group of settlements, some of which contain some large residential properties, to both west and east of the main road. Other settlements are Union Street and Dale Hill to the west, and Seacox Heath to the east. Including the surrounding woods and fields, Flimwell covers an area of approximately 860 acres (350 ha), of which only approximately 5% is built-up. South-east from Ticehurst and due north-east from Burwash, is a small settlement, Stonegate. It came into being at the same time as the railway line from Tunbridge Wells. The station at Stonegate has hourly train services to London (Charing Cross and Cannon Street) and to Hastings. The next stop from Stonegate to London is Wadhurst and towards Hastings is Etchingham. In Stonegate, there is a Church of England primary school and the Anglican church of St Peter. There is a railway station nearby, at Stonegate (until 1947 it was called Ticehurst Road; and before that Witherenden); and there is a bus link to Wadhurst railway station. ^ "Civil Parish population 2011". Retrieved 8 October 2015. ^ "Ticehurst". Parish/Town Councils. Rother District Council. Retrieved 26 April 2008. ^ "Ticehurst and Etchingham ward population 2011". Retrieved 8 October 2015. ^ Michael Davie (15 March 1994). "Obituary: Evelyn Nightingale". The Independent. London. Retrieved 8 March 2011. ^ "Anne Redmon Is Bride". New York Times. 14 August 1964. Retrieved 8 March 2011. ^ "Pashley Manor Gardens :: Historic Houses Association". Hha.org.uk. Retrieved 22 April 2016. ^ "Tulip Festival April / May – 25,000 tulips". Pashley Manor Gardens. Retrieved 22 April 2016. ^ St Peter, Stonegate, Church of England's A Church Near You website. This page was last edited on 12 April 2019, at 08:38 (UTC).